Today's recipe is an easy and healthy salad called "chou-fleur vinaigrette". During my childhood in France, it was a dish that was served fairly frequently at the cafeteria of my elementary school (carottes Vichy too!). 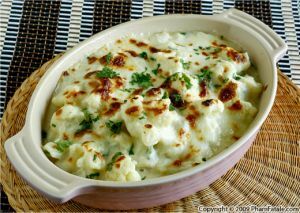 Cauliflower is boiled, then coated with vinegar and oil and sprinkled with flat-leaf parsley. That’s it! 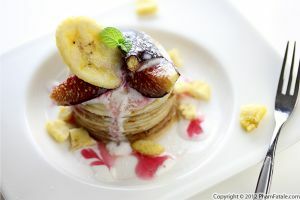 Who says French cooking has to be complicated? I've mentioned quite a few times lately that I've been trying to eat healthier. 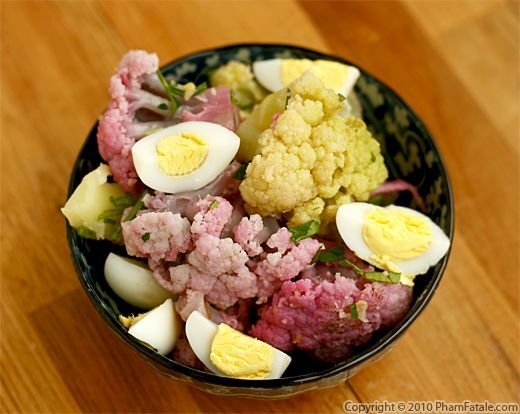 Cauliflower is a big part of that because it's packed with fiber and vitamin C. But cauliflower salad is not a full meal by itself, so I added hard-cooked quail eggs and a piece of bread on the side. 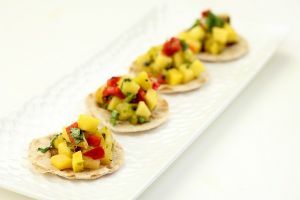 It’s a simple, quick and healthy summer meal. Rachael Ray would be proud! Crack the shell and roll them by gently pressing them for easy shell peeling. Rinse the eggs, in case there's any shell stuck to the egg, then cut in half. 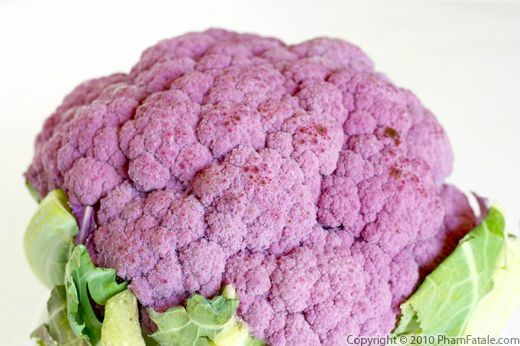 To cut the head of the cauliflowers into florets, remove and discard the green leaves and the stem. 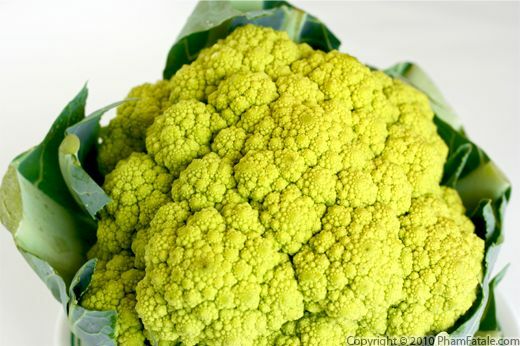 Place the cauliflowers in a large bowl, cover them with water and add the white vinegar. Stir well. Soak (see tips) for 5 minutes, then drain. Fill a pot with cold salted water and bring to a boil. Add the whole cauliflowers, bring back to a boil, then reduce the heat to medium-low. Cook for about 20 minutes. The cauliflower should be fork-tender (not mushy). Drain the water. Season with 1 teaspoon of salt and 1/4 teaspoon of pepper. Allow to cool a little. Once the cauliflowers are cool enough to handle, cut into wedges from the bottom. Pull and separate the small florets. In a small bowl, combine the mustard, sugar cane vinegar, cumin, turmeric (if used) and both canola and walnut oils. Season with salt and pepper. 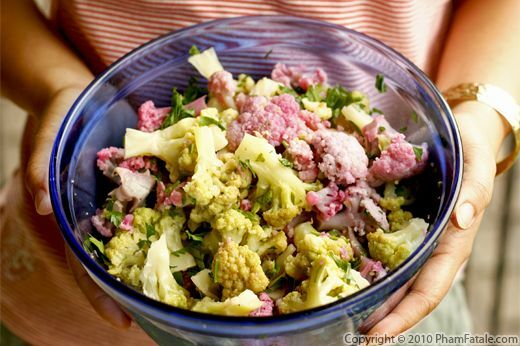 In a large serving bowl, add the warm cauliflower and drizzle with the vinaigrette. Sprinkle with parsley. Toss well. Let sit for 30 minutes before serving. Add the halved quail eggs (if used). I used colored cauliflowers for an aesthetic, appealing presentation. For the salad dressing, I usually add a little mustard which is a great binder (it contains lecithin) for a smooth-textured vinaigrette. You can find quail eggs in the Asian market. 10 eggs cost $0.99. I bought the sugar cane vinegar in Ranch 99 in Mountain View. 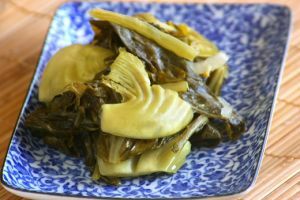 If you're planning on serving this dish as a light meal for lunch, add hard-cooked eggs, sun-dried tomatoes, diced hearts of palm and mâche (it's known as "lamb's ear lettuce" in the U.S), served with a piece of bread and you'll have a full meal. You could make the same salad using broccoli florets with chives; it's just as delicious. 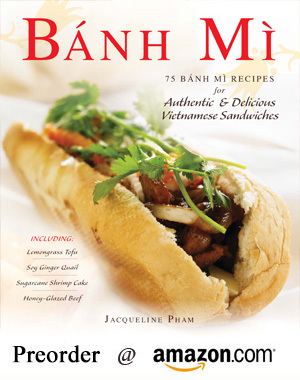 Published By: Jacqueline Pham on July 11, 2010.